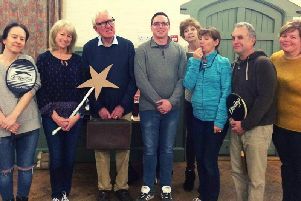 A concert is being held at Aylesbury Methodist Church celebrating the work of 1950s and 1960s British comedy duo Michael Flanders and Donald Swann. Oliver and Samuel Hancock will be performing a selection of the pair's comedy songs at Aylesbury Methodist Church in Buckingham Street on Saturday February 9 at 7.30pm. Between 1956 and 1967 Flanders and Swann packed theatres in England and overseas with their shows ‘At the drop of a hat’, and ‘At the drop of another hat’, which both earned rave reviews. The Hancock's will be recreating the pair's songs by putting a modern spin on them. Tickets are £10 per person or £5 for under-18s and are on sale now from the church office on weekday mornings or by contacting organiser Derrick Matthews on 01296 488076.